I just realized that I never posted this! This happened nearly a year and a half ago, but I'm going to go ahead and share it now. Here is the post originally written in November 2017. I recently attended a YA book signing/happy hour event hosted by the Tattered Cover. I went because Maggie Stiefvater was in town for her All the Crooked Saints Tour and I decided that I wanted to meet her. I have a fair amount of reverence for Maggie Stiefvater and always felt a little intimidated by her because she's so talented. For a while, I was OK not ever meeting her. Plus I order most of her books through Fountain bookstore, so they arrive already signed, doodled in, and usually with her bookplate. As such, I didn't have many options for her autograph. But I do own her tarot card deck (which I love because they are beautiful and based on the Raven Cycle). I decided I would ask her to sign her favorite one. When I got to meet Maggie Stiefvater, she wasn't scary at all. She was so nice and conversational. I told her that I tended to order her books already signed from the Fountain Bookstore, which she liked because she said that her fans help keep the shop afloat. 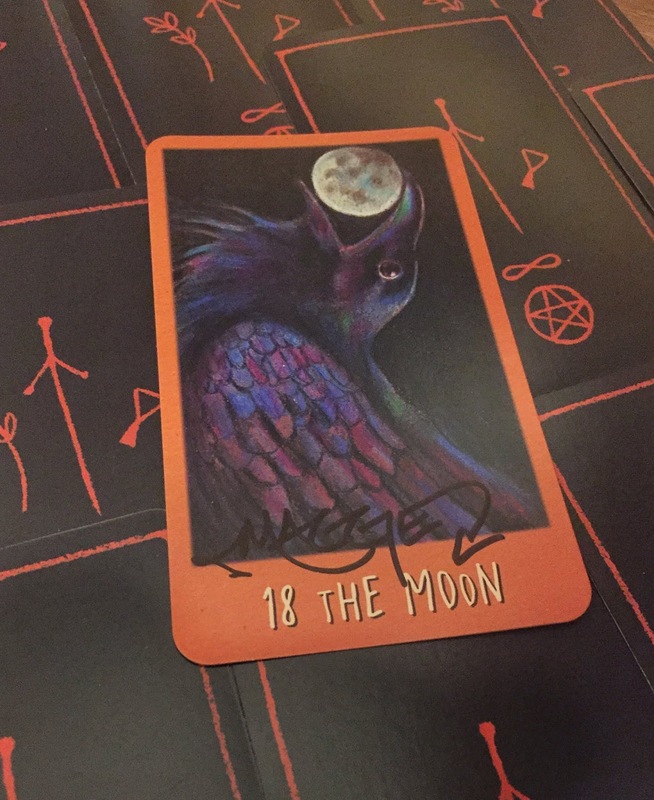 I asked if she had a favorite of her tarot cards she'd be willing to sign and she told me that her favorite was the Moon. Essentially, her explanation was that she likes the Moon because you can tell that you are approaching something in the dark, but you don't know if it's dangerous or not until you get close, but either way makes for an adventure. We talked a bit about her books and she said that the lady who inspired Persephone was also there, so I had to go meet her of course. I also met Jeff Zetner, who I was also a bit intimidated to approach, but he was also very nice. I received his book, The Serpent King, in an Owlcrate and did not expect to like it as much as I did, so I asked him to sign my copy instead of his new book (which I did buy there). He did and he also signed his letter that he included with the Owlcrate book because I keep the author letters in the books. And he told me to watch out for the Serpent King reference in his new book. Otherwise, I met plenty of other authors whose books I haven't read (yet). They were all nice and it was a very fun night!